By the time the United States entered World War II in December 1941, the British, French and Russians had already printed and dropped a host of surrender leaflets on the German Army. The leaflets were of different sizes, colors, texts, and even the surrender instructions were different. There was no overall guidance, and certainly no uniformity. This all changed with the arrival of American troops in the United Kingdom and the strong alliance between the U.S. and British psywarriors. 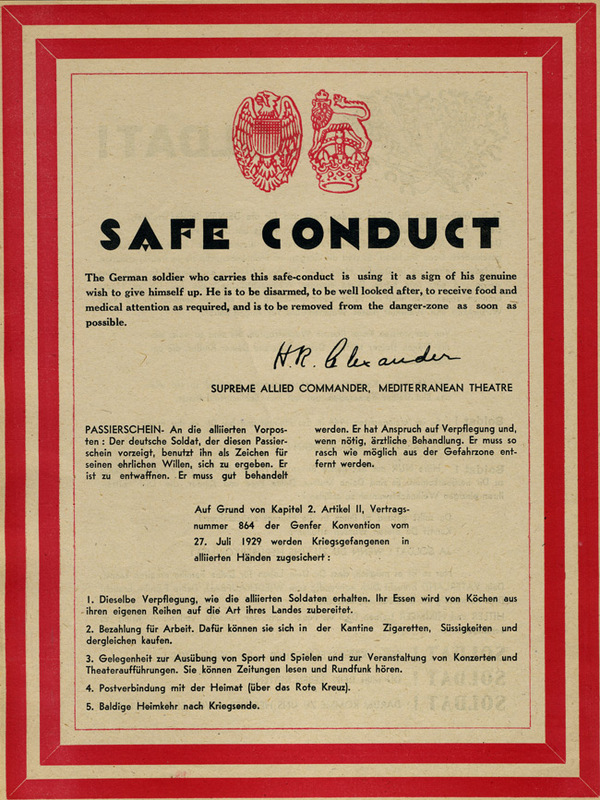 For the first time the two allied nations worked together to prepare a standardized safe conduct leaflet that would be exactly the same wherever used. 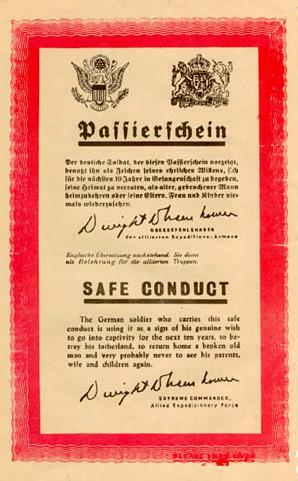 The final version of the "passierschein" has been called the most effective single leaflet of the war. 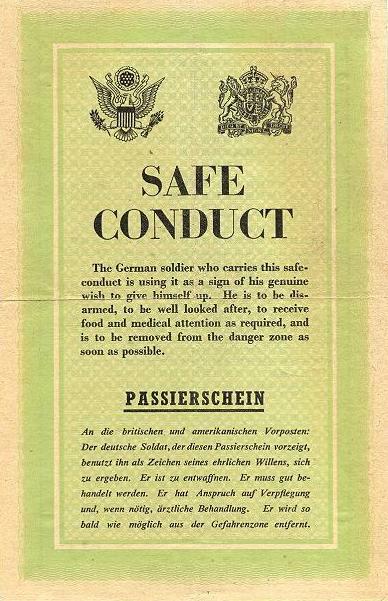 It was considered so powerful that in 1944 the Allied Supreme Headquarters issued a directive forbidding reproduction of the safe conduct pass on other leaflets. They wanted to protect the authenticity of the document. How did this leaflet evolve? What were the intermediate steps and what changes were made? This is the story of the most effective leaflet of World War II. 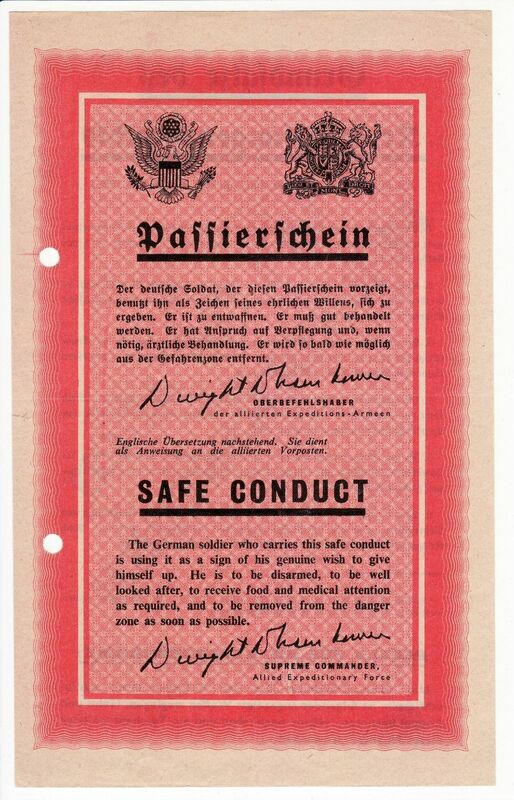 The story of the "passierschein" ("safe conduct pass") for Germany is interesting because of the alleged belief on the part of the Allies that the German officer or soldier would react in a positive way to an official looking document. Therefore, the Americans and British collaborated to produce a fancy official document bearing national seals and signatures that would rival a stock certificate. They produced the leaflets late in the war in various formats with different code numbers. Germans liked things done in an official and formal manner, even in the midst of chaos, catastrophe and defeat. 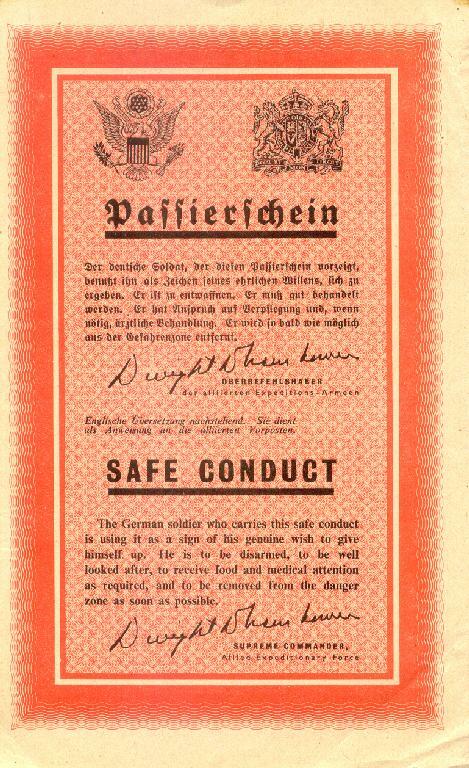 The Allied obliged, and gave the Germans various forms of very official looking surrender passes. One is printed in red and has banknote-type engraving which makes it resemble a soap-premium coupon. everything about the leaflet was designed to appear authoritative: the format handsomely engraved on good paper in a rich color, has been described as "looking like a college diploma. 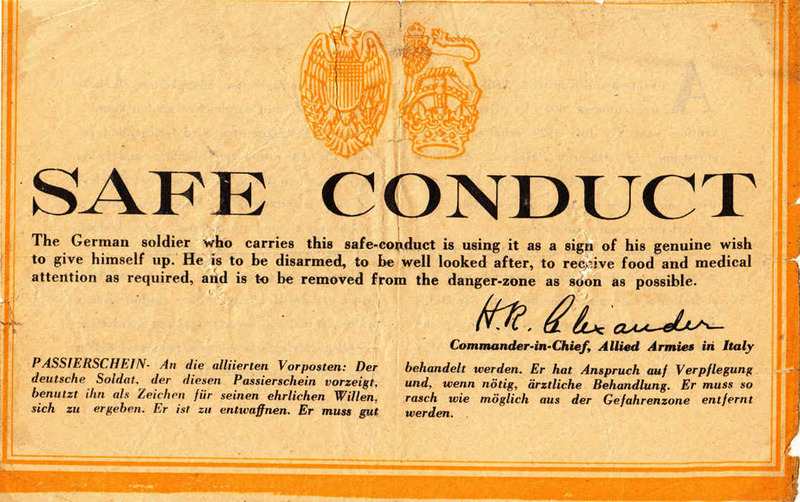 The German soldier who carries this safe conduct is using it as a sign of his genuine wish to give himself up. He is to be disarmed, to be well looked after, to receive food and medical attention as required and to be removed from the danger zone as soon as possible. Some of the leaflets also have the message in French on the front. All of the leaflets have the great seals of the United States and the United Kingdom on the top front; those with French-language text also have the seal of France. All of the passes bear the facsimile signature of General Dwight D. Eisenhower. The messages on the back differ in subject and length but most stressed six points. 1. Immediate removal from the danger zone. 2. Decent treatment as befits soldiers. 3. The same food as American soldiers. 6. Return home after the war as soon as possible. To the Survivors, soldiers and officers of the 7th Army. 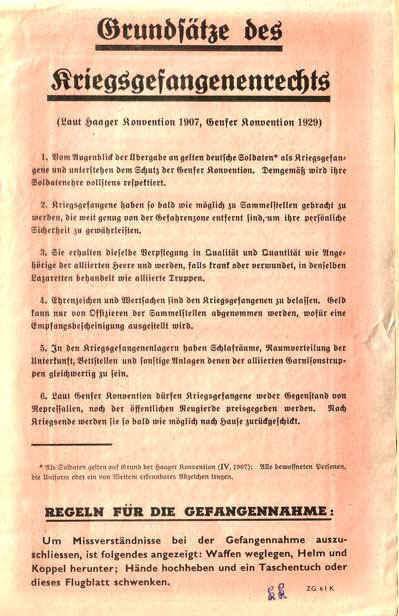 This leaflet bears the passierschein on the back identical to leaflet ZG53. 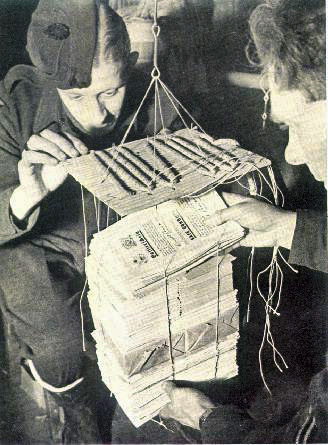 640,000 copies of leaflet ZG49 were dropped on 16 August 1944. 1. Stay back! Whoever proceeds to the Seine will meet thousands of fighter-bombers. 2. Stay away from the streets! The retreat routes are streets of death. 4. Rally yourselves! The eldest (of you) will be responsible for the discipline. 5. Helmet down  belt also  hands up! Wave a white flag! We are obliged to treat you fairly and correctly like opponents that fought bravely for as long as they could before they were forced to surrender due to the enemy superiority. Show the reverse of this leaflet upon surrender! 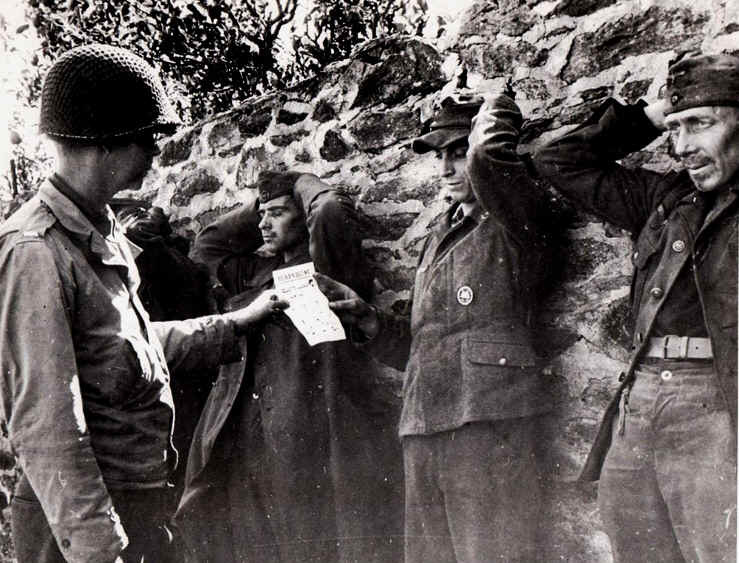 Germans in France surrender using leaflets. 26 September 1944. 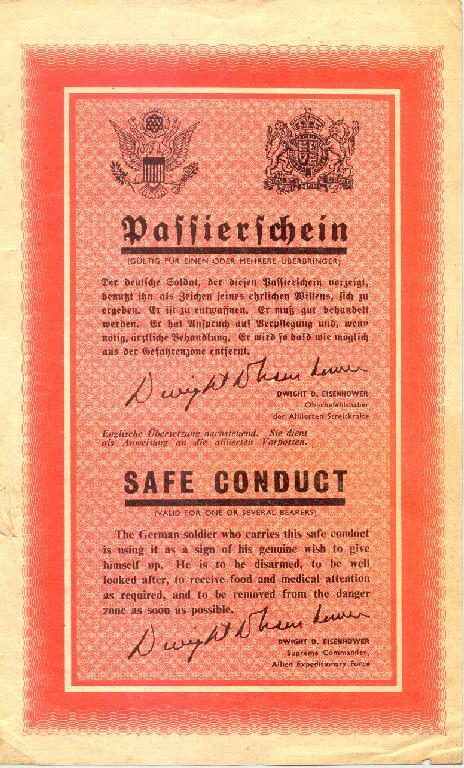 In order to have a single safe conduct pass for the entire front, the safe conduct pass was produced only by Psychological Warfare detachment SHAEF. 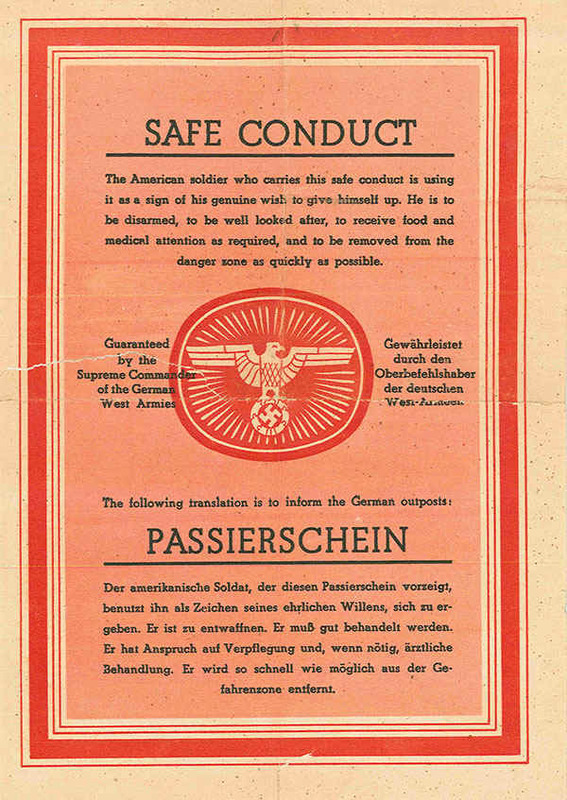 In December, 1944, Psychological Warfare Detachment SHAEF issued directives forbidding reproduction of the safe conduct pass on the reverse of Army Group leaflets in order to protect the authenticity of the document. Most of the safe conduct passes bear a "ZG" code, though some bear a "WG" code. These codes were used on combined US-British SHAEF leaflets to Germany 1944-1945. There are six disseminated versions of the leaflet and they were constantly improved through each production run. They were printed by Waterlows of London. 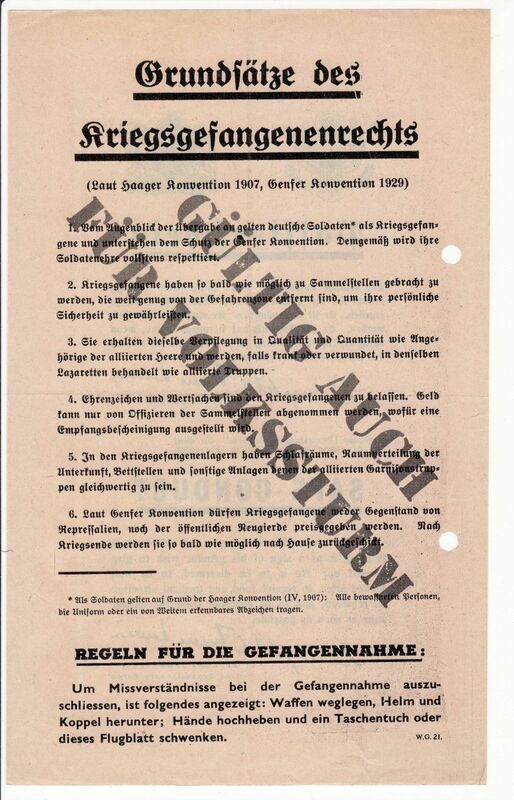 Among the leaflets using the general format of the Passierschein are WG21, ZG21, ZG21A, ZG37, ZG61, US/GB-ZG61A-1944, ZG61K, ZG76, US/GBZG.90 1944, and US/GB-ZG.139-1945. ZG21 was dropped in July of 1944. The Allies printed 4,253,175 and dropped 3,360,000. 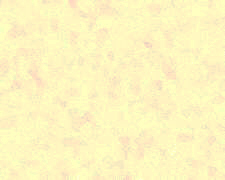 This is an early version in brown and light gray-yellow from the Headquarters, 21st Army Group. The text on the back mentions Chapter 2, article II, treaty number 864 of the Geneva Convention in regard to German prisoners of war receiving the same rations as Allied soldiers, payment for camp work, educational lessons and mail. 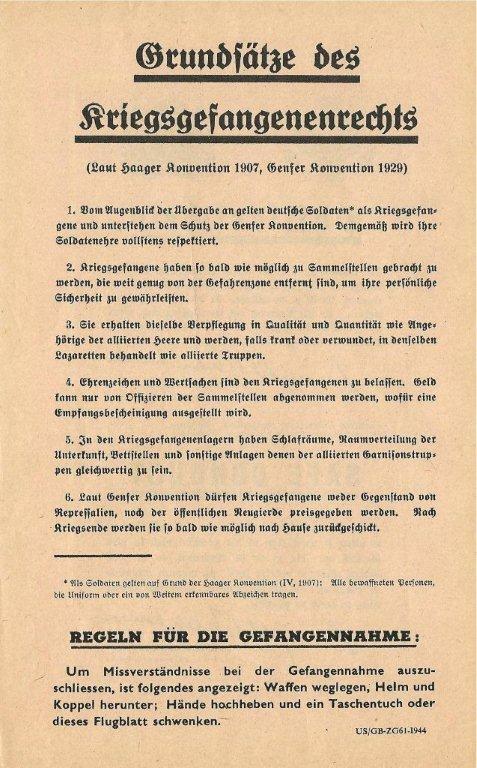 In this early version, the English text is above the German, there are no signatures of any commanding officer, and the authority is the 21st Army Group. 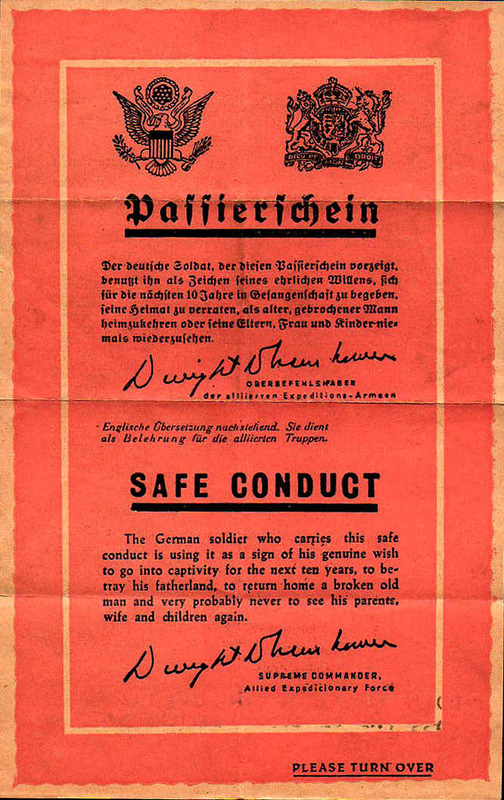 As we mentioned earlier, once SHAEF designed a standard leaflet to be used by all forces, the Army Group was prohibited from printing and disseminating such leaflets. 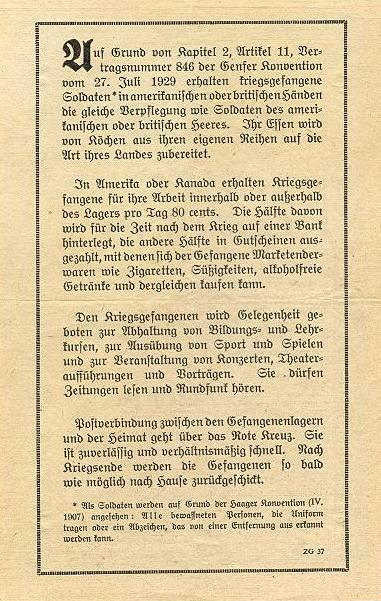 An almost identical leaflet was meant to be dropped to Germans in France. It is coded ZG21a. Records show that 253,175 were prepared for delivery to France, but there is no official record of them being distributed. In accordance with Chapter 2, Article II, Treaty Number 846 of the Geneva Conference of July 27, 1929, prisoners-of-war in American or British armies: Their food is prepared in their own manner by cooks taken from their ranks. In America or Canada, prisoners-of-war receive 80 cents a day for work inside or outside the camp. Half that amount is deposited in a bank for after the war, the other half being paid in tickets which enable prisoners-of-war to purchase cigarettes, candy and soft drinks, etc., at the canteen. Prisoners-of-war are afforded facilities for the holding of courses of instruction and study, for the performance of sports and games, the holding of concerts, theater performances and lectures. They may read newspapers and listen to the radio. All communications between the prisoner camps and home goes via the Red Cross and is fast and dependable. After the war, prisoners are returned to their country as soon as possible. When Eisenhower was appointed Supreme Allied Commander for the Normandy invasion he suggested that General Alexander become ground forces commander. However, Alexander remained in command of the 15th Army Group in Italy and eventually captured Rome in June 1944. Alexander remained in command of 15th Army Group, as well as its successor, the Allied Armies in Italy, for most of the Italian Campaign, until December 1944, when he relinquished his command to American General Mark Clark and took over as the Supreme Commander of the Allied Forces Headquarters, responsible for all military operations in the Mediterranean. Alexander was promoted to the rank of Field Marshal. We should point out that leaflets similar to the above were produced by the Psychological Warfare Branch (PWB) of Allied Forces Headquarters in the Mediterranean (AFHQ). 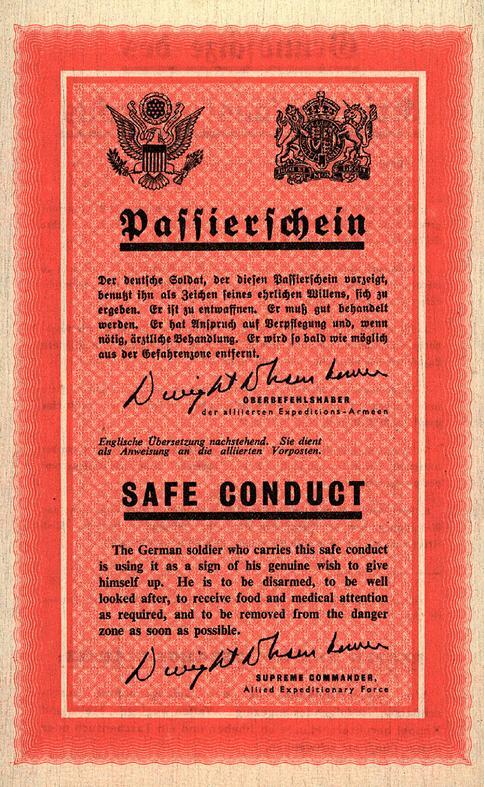 The standard safe conduct pass was used in Northwest Europe by The joint Anglo-American Psychological Warfare Division (PWD) of Supreme Headquarters, Allied Expeditionary Force (SHAEF). They were generally signed by Eisenhower. The PWB leaflets were not signed by General Eisenhower since he was not Allied Commander in the Mediterranean Theatre. Notice that this leaflet is signed by General H. R. Alexander, Commander in Chief, Allied Armies in Italy. We should mention that Harold Rupert Leofric George Alexander was later promoted to Field Marshal and titled 1st Earl Alexander of Tunis. Notice also that the seals at the top of the leaflet are different that the usual U.S. and British national emblems. It has been suggested that they are the WWII emblems of the U.S. and British Armies. In accordance with Chapter 2, Article 11, Treaty Number 846 of the Geneva Convention of July 27, 1929, captured soldiers* in American or British hands receive the same food as soldiers of the American or British Armies. Their food is prepared in their own manner, from cooks taken from their ranks. In America or Canada, prisoners of war receive 80 cents a day for work inside or outside the camp. Half that amount is deposited with a bank for after the war, the other half being paid in tickets which enable prisoners of war to purchase cigarettes, candy and soft drinks, etc., at the canteen. Prisoners of war are afforded facilities for the holding of courses of instruction and study, for the performances of sports and games, the holding of concerts, theatre performances and lectures. They may read newspapers and listen to the radio. Mail connection between prisoner camps and home goes via the Red Cross and is reliable and comparatively fast. After the war, prisoners are returned to their country as soon as possible. * According to The Hague Convention (IV, 1907) the following are considered as soldiers: All armed persons wearing uniforms or a badge which can be clearly distinguished from a distance. 1. From the moment of surrender, German soldiers are regarded as P.O.W.s and come under the protection of the Geneva Convention. Accordingly, their military honor is fully respected. 2. P.O.W.s must be taken to assembly points as soon as possible, which are far enough from the danger zone to safeguard their personal security. 3. P.O.W.s receive the same rations, qualitatively and quantitatively, as members of the Allied armies, and, if sick or wounded, are treated in the same hospitals as Allied troops. 4. Decorations and valuables are to be left with the P.O.W.s. Money may be taken only be officers of the assembly points and receipts must be given. 5. Sleeping quarters, accommodation, bunks and other installations in P.O.W. camps must be equal to those of Allied garrison troops. 6. According to the Geneva Convention, P.O.W.s must not become subject of reprisals nor be exposed to public curiosity. After the end of the war they must be sent home as soon as possible. Soldiers in the meaning of the Hague Convention (IV, 1907) are: All armed persons, who wear uniforms or any insignias which can be recognized from a distance. To prevent misunderstanding when surrendering, the following procedure is advisable: Lay down arms, take off helmet and belt, raise your hands and wave a handkerchief or this leaflet. The Smaller Artillery Version  ZG61A. This miniature leaflet was fired inside an American artillery shell and you can see the stippling down the right side caused by the explosion that releases the leaflets into the sky. The leaflets were found in 1962 among stock ammunition (both current then, and much left over from WWII) held in 3 Base Ammunition Depot, Bracht, Germany (very close to the Dutch border). The depot has long since closed but was then the largest British Ammo Depot in Germany. I was a Captain in the Royal Army Ordnance Corps (RAOC) and it was my first appointment as an Ammunition Technical Officer (ATO) after completing 15 months training in UK. I can't remember why that particular round of ammo was selected for examination; possibly because it had different markings to others in the same batch. Anyway after we found the leaflets we opened up others in the hope of finding more but that was the only one. We shared the leaflets we found between the technicians in the ammunition workshop, and that's how I came to have mine, which have been in a box in the roof for 49 years! Curiously, the Supreme Headquarters Allied Expeditionary Force says in the formerly restricted booklet Leaflet Operations in the Western European Theatre that this most successful of all Allied leaflets was actually based on an idea first found in Russian combat leaflets. Since we were allies during the war the U.S. Army apparently was willing to give the Russians some credit. I am sure after the war was over nobody would credit the Russians with any successful ideas. Designed as a document complete with the crests of Great Britain and the United States, the S.H.A.E.F. 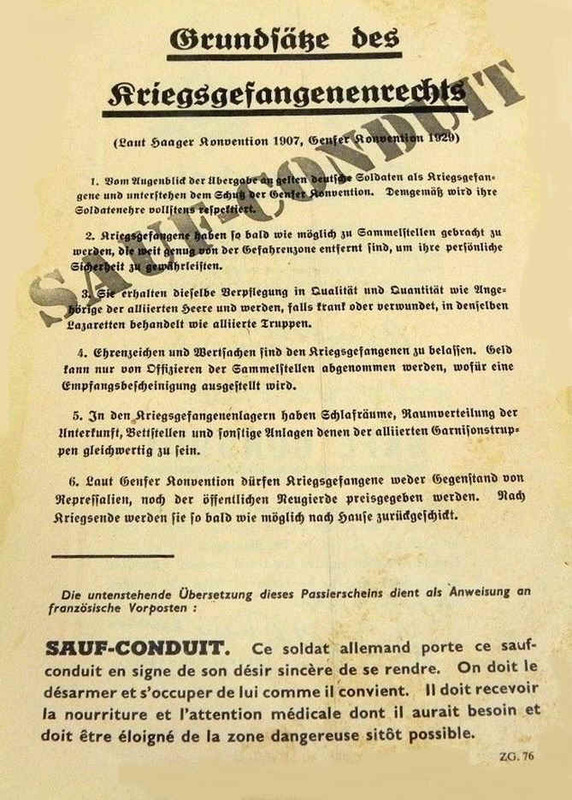 insignia and the signature of the Supreme Commander, this leaflet embodied the relevant provisions of the Geneva Convention and instructed the Allied outposts to take the bearer prisoner and treat him decently. So successful was this leaflet all through the campaign that it was mixed in the proportion of 10 percent, and later, fifteen percent, with all other combat leaflets dropped. 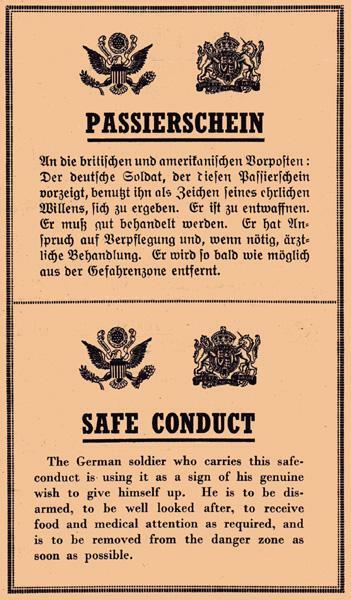 In situations especially favorable from a tactical point of view, bombs filled with nothing but Safe Conducts were dropped on German troops. According to the Hague Convention, 1907, and the Geneva Convention, 1929. 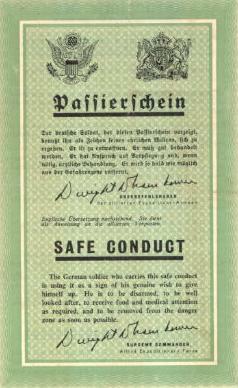 This German soldier carries this safe conduct pass as a sign of a sincere desire to surrender. We must disarm and the deal with him appropriately. He must receive the food and medical attention he needs and should be moved from the danger zone as quickly as possible. ZG90 was dropped from December 1944 to April 1945. The Allies printed 34,988,000, and dropped 30,968,800. 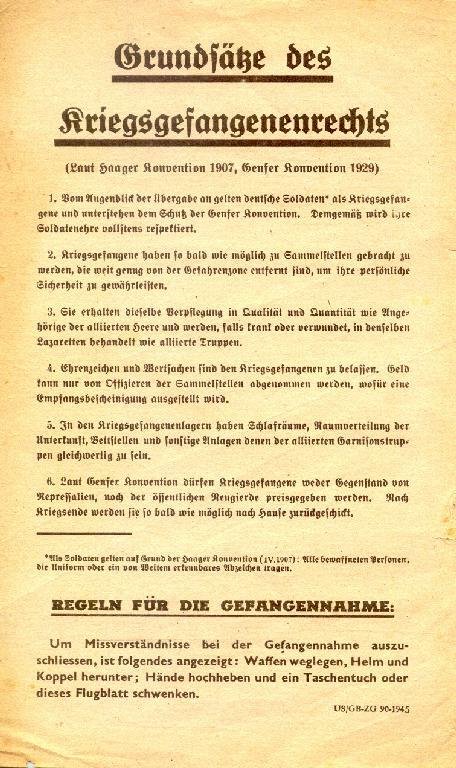 This leaflet has a small added comment under the word "Passierschein" on front which says, "Valid for one or several bearers." 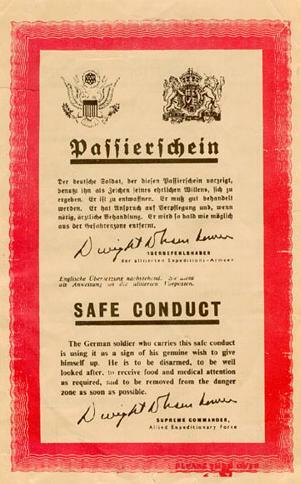 It was meant to convey to the German soldier that multiple users could come across the lines on one passierschein. The text on back is entitled "Basic Principles of International Law Regarding Prisoners of War." The reprint is a faithful full size full color two-sided reproduction of both the front and the back on high quality paper. It very, very closely resembles the original in every way. On 2 March 1945 there was intensive shelling of Oberaussem, located between Aachen and Cologne. The Germans and Americans were shooting at each other with howitzers. There were four German soldiers in the shelter that were uncertain about what to do. I talked to them and suggested that if they intended to fight they should leave the shelter and not expose the civilians to harm. I also told them that I could speak English and could assist them in surrendering. After some back-and-forth talk they informed me that they would not fight and intended to surrender. 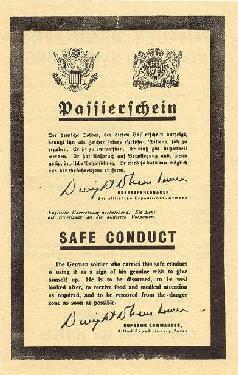 They had copies of the ZG-90 safe conduct leaflets that had been dropped by the millions from Allied planes. 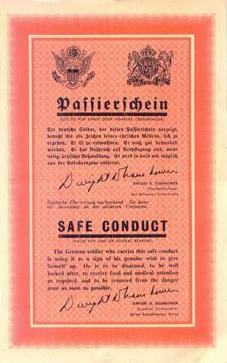 These safe conduct passes were addressed to German soldiers and told them that they would be treated humanely if they surrendered. About 4:30 p.m. we heard machine guns just outside the shelter. Then the door to the shelter splintered and the area near the door was sprayed by machine gun fire. On some other Allied propaganda leaflets it was stated that those who wanted to surrender needed to shout as loud as possible Ei Sorrender. I took that message to heart and started yelling as loud as I could I surrender! 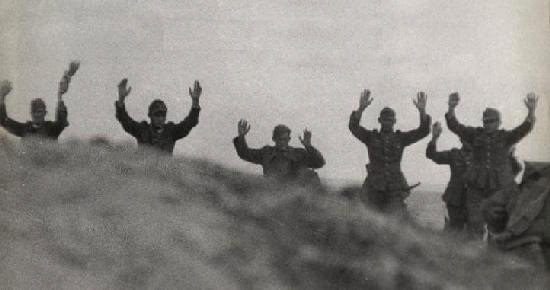 We surrender! The German soldiers shouted Wir Ergeben Uns. After a short time, which seemed like an eternity, we heard the words, Come here. I told the German soldiers to raise their arms and marched them outside. The three American soldiers burst out laughing when they saw my disheveled personage bringing out four frightened prisoners of war. The GIs shook my hand, patted me on the back and started playing Santa Claus. They gave me chewing gum, cigarettes, grapefruit juice and a can of corned beef. The two soldiers and sergeant were from the 395th Regimental Combat Team attached to the Third Armored Division. Basic Principles of international Law Regarding Prisoners of War. There is also a US/GB ZG.90A-1944 and US/GB ZG.90K-1944. They are basically identical to US/GB ZG.90-1945, except that the A variety is 11x18 centimeters. I have seen the K version on crinkled paper which indicates that it was delivered by artillery shell. The Volkssturm was the territorial army formed to defend the home front in WW II. The unit pass is to be used for the surrender of larger units  Companies, Battalions and larger units. This unit pass takes the place of a document of surrender signed by the Company Commander (Battalion Commander, Commander of Battle Group, etc.) or by his duly authorized representative. The unit pass must be brought in by the Company Commander (Battalion Commander, Commander of Battle Group, etc.) or by his duly authorized representative. The bearer of this Unit Surrender Pass undertakes to surrender his unit without resistance. On the other hand, the unit will be immediately removed from the battle zone in its entirety. The unit is guaranteed the same treatment as commonly accorded to Prisoners of War, strictly in accordance with the Geneva Convention, (as detailed on the back of this document). In the portion appearing below, the Allied outposts are instructed to give the bear of this unit pass all cooperation in facilitating his task. The unit pass was coded ZG102. The allies printed 6,250,000 of them and dropped 4,250,000 of them from January to April 1945. 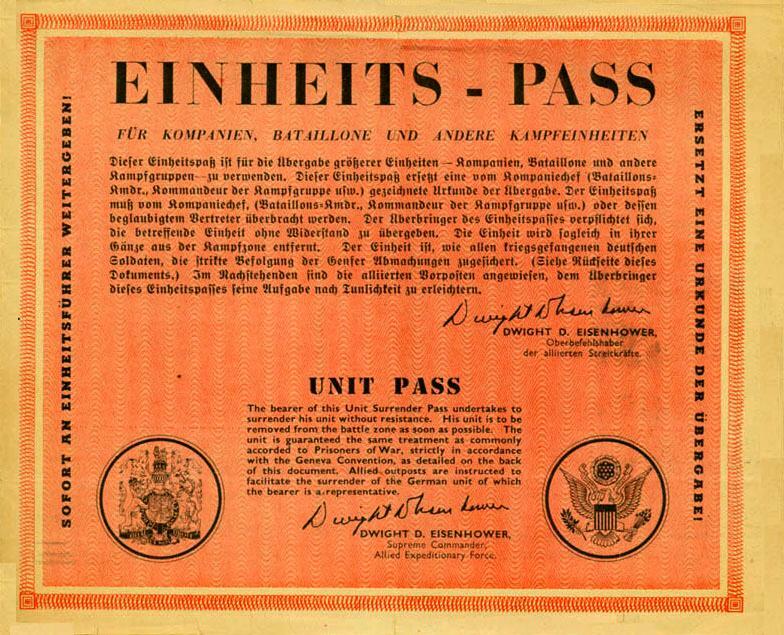 .Many German soldiers called it an admission ticket. Others referred to it as a free pass for life. The fact that after very early drops, it carried the signature Dwight D. Eisenhower in facsimile, unquestionably gave it higher prestige and conviction. It was good for one or more. Later, a unit surrender pass helped to pull them in. To please literal minded Krauts it was twice the size of the single surrender ticket. Sound psychology in dealing with Teutons. 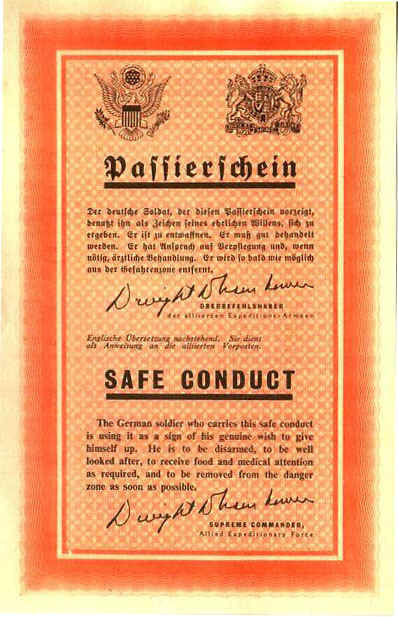 The German soldier who carries this safe conduct is using it as a sign of his genuine wish to go into captivity for the next ten years, to betray his fatherland, to return home a broken old man and very probably never see his parents, wife and children again. (Signed) Dwight D. Eisenhower, Supreme Commander Allied Expeditionary Force. Mister Eisenhower considered it to be efficient to send our soldiers safe conduct passes for desertion. They look like this sheet of paper. We are returning your age old dodge, after having made the necessary rectifications, with sincerest thanks. It was highly amusing, and we must commend you on your efforts. But please refrain from molesting us further in this direction. It should be obvious to you that the ideals for which 90 million Germans have fought (according to Churchill) "like lions" for over five years cannot be so very rotten that we could be lured into surrender through mere ham and eggs. Rather a cheap inducement on your part, indeed. This copied safe conduct was then shelled over to the enemy. It�s his turn what to do with it. Had you answered in exactly the same way? Did the Scorpion sting back well? Dont know if this onell pass the censor  I believe so. During the war, all mail being sent home from the front would be opened and checked to make sure that no military secrets were accidently given away. 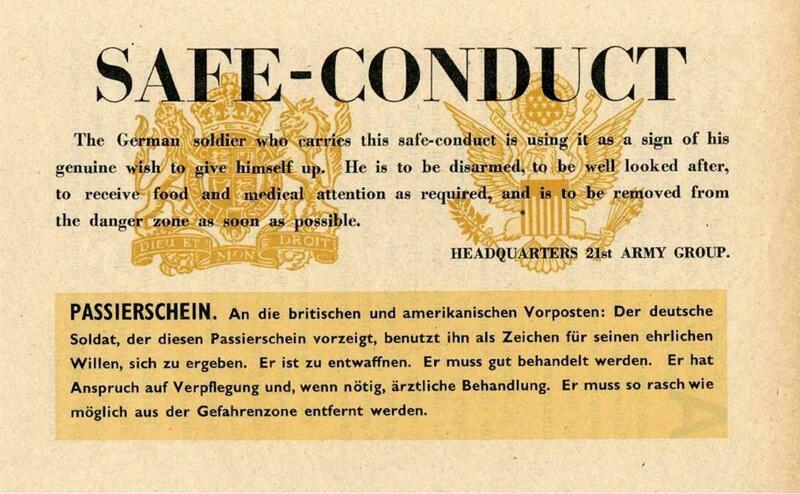 The soldier wonders if some American censor will find the leaflet to be Nazi propaganda and confiscate it. Luckily for him, the censor clearly realized that this was just a harmless war souvenir and let it pass. Note: The Germans mention The Scorpion in the above leaflet. They had a propaganda organization called Skorpion that produced leaflets under the general direction of Himmler. Early in the war the German Army produced many leaflets, but after the attempt on Hitlers life, the job was giver to Himmler. 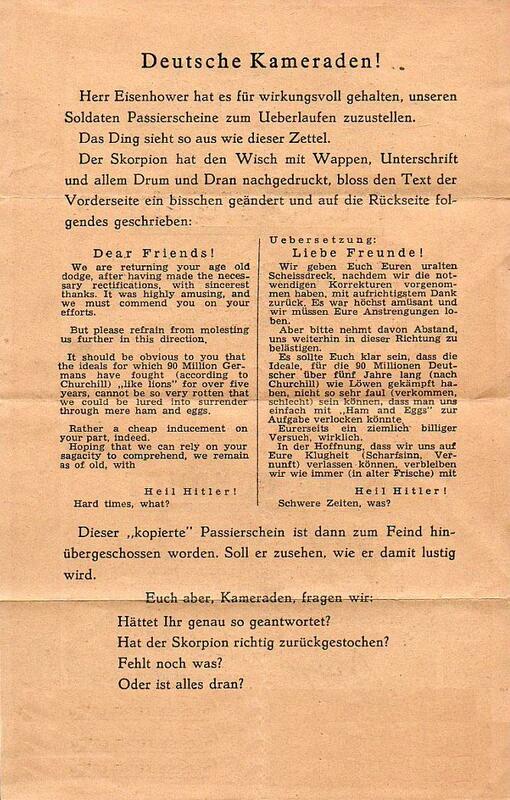 Many Skorpion leaflets were marked with a black scorpion. 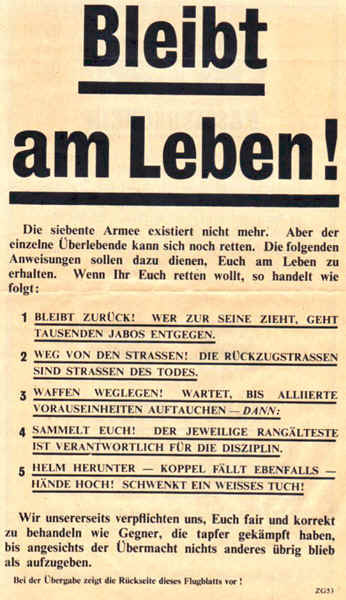 The leaflet points out that the propagandists have fought back against the Allied propaganda and ask the German soldier if he also has fought back. 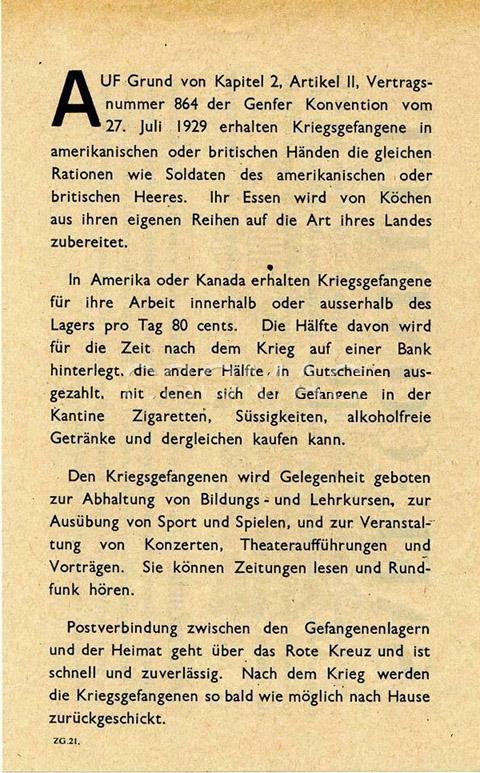 Due to the growing interest in WWII propaganda leaflets, some forgeries of the American WWII Passierschein and the German rebuttal have recently appeared on the market. They are fairly good copies with one major mistake. The colors are reversed. Instead of being on red paper with a white border, the copies were printed on white paper with a red border. It is hard to understand such a blatant error, unless the forgers wished to be able to say that they were not attempting to fool anyone or partaking in a counterfeiting scheme, since the colors were obviously wrong and the leaflets were obvious fakes. In 2011, better counterfeits of the Passierschein appeared. The one above is coded 61K and has the right color combination and there is a good reason. 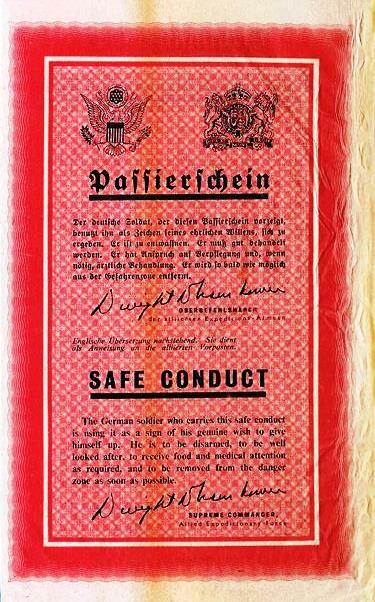 I noticed on the back that the German collector Klaus Kirchner had stamped it, meaning that the genuine leaflet was in his stock at one time. Someone bought the leaflet, copied it front and back with the KK stamp still on the back and offered it on EBay as a reprint at $14.99. Another German gave himself up with the statement that he had "a document bearing General Eisenhower's personal signature." In one day 44 men of the 256th Volksgrenadier division deserted to a Third Army unit and nearly all carried the Safe Conduct surrender pass. Readers with more information on any aspect of this article are encouraged to write the author at sgmbert@hotmail.com.